Starring: Mark Torgl, Mitch Cohen, and more. Part 2 of Ben (Vanbrockalockalypse) Van Brocklin’s request comes ‘The Toxic Avenger’! Luckily I am happy to say that I made it passed the fifteen minute mark unlike his first request of ‘Poultrygeist: Night of the Chicken Dead’. If you missed that painful review, you can check that here. As of now, let us begin my request review of ‘The Toxic Avenger’. In the city of Tromaville, a toxic waste dump, citizens carry on with their normal everyday lives although living under a corrupt city government. Among those citizens is Melvin Junko (Mark Torgl), whose awkward and dorky being follows around patrons of the Tromaville Health Club during his job as janitor of the club. Among those patrons is Wanda, Julie, Slug, and Bozo (Jennifer Babtist, Cindy Manion, Robert Prichard, and Gary Schneider). This group goes around as the cool cats of the club and terrorize Melvin due to his oddness. This torment of Melvin goes to a point where a prank is pulled on him by the four, which leads him to running away in embarrassment and accidentally falling out of a window and into a barrel of toxic waste. Being exposed to such a high volume of waste results in his body mutating himself into what is The Toxic Avenger (Mitch Cohen). 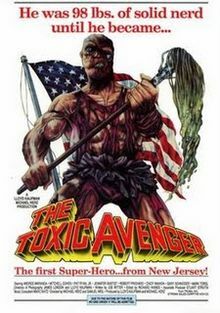 After the transformation, The Toxic Avenger frequents the city of Tromaville on a two part mission. 1. Overthrow all the criminals of the city and make it a peaceful and happy city. 2. Get revenge on the people who wronged him and turned him into the monster he became. This film was God awful. It was so awful but was terribly entertaining to a point where I could not look away unlike my first Troma request. “The Toxic Avenger” was funny and entertaining but dear lord, if you do see this, do NOT expect any sort of normalcy from this film. It is weird, (bad) gory, terribly written, and terribly acted but such a train-wreck that it was entertaining. Recommended for your drunken boredom. Lol, I am sorry, this gif is just too funny to not post on here.